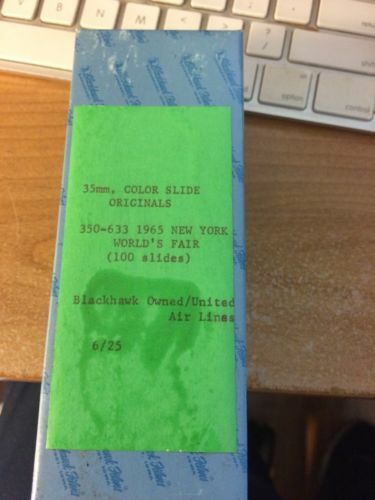 I recently purchased some Blackhawk Films / United Air Lines MAINLINER Vacation Series of slides from the '64 Fair. What information can you give me about the series? How many slides were in the series? How were they numbered? Anything else about the series that you might be able to share? Actually I've been doing some searching of posts here at the Community and I did find a bit of information on the slides. Also have found that Bill Cotter has wonderful list of them on his website! Thanks very much for any additional info. There are some really beautiful shots in the sets I purchased. 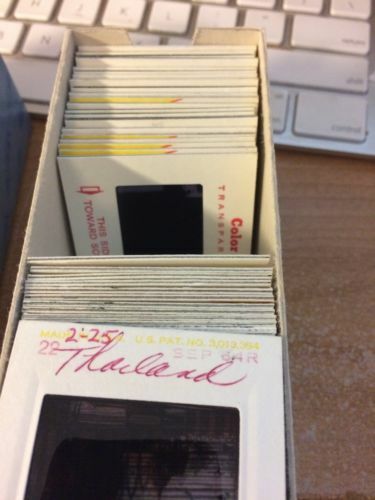 One box is a set of masters of the slides that came from Davenport, IA. The box is labeled 6/25 and 350-633. According to Bill's website, this is the "633" set of slides. Of them the seller said, "I went to Davenport, IA to buy a large storage locker full of books,(over 240 boxes). While there the owner(a house flipper/real estate agent) asked me to look at another storage locker full of stuff. Located in this mess of boxes were 3 Large boxes of slides and ephemera of Blackhawk Films Slides and materials. When I finally got home and looked, I realized I stumbled across thousands of amazing originals/masters. The woman’s house where these items came out of was the film editor/negative dept. head for Blackhawk Films. Her name and picture are actually in the back of the catalogs. Also, in the box were “sample copies” or what I believe were back-ups to each of the masters." Bill, I am traveling and will send more details when I get home. Congratulations on the acquisition . If you need them scanned let me know.